And YA'LL - I am just SO hungry! I had no appetite for the first 20 or so weeks and now I can not get enough food. I eat a big meal and 30 minutes later - I'm famished and wondering what else I can eat. I've been trying to stock up on fruit and healthy snacks but I'm just an eating machine! My goal was to gain only 25-30 lbs and I hope I can stick to it. I'm just pretty sure weight isn't going to "just come off" a 35 yr old body like it might on a 25 yr old. But I would gain 100 lbs to get my sweet Harper here! I've been working on her baby book. I went to Hobby Lobby on 50% off week and got a bunch of cute paper along with a cute album and I've been filling it up with things and pictures all about my pregnancy. I think it has been more this fun to make it myself and I can keep it up through her young years. I got a brown comforter and sheets for my daybed. Then I'm going to get more pink pillows to add on here. 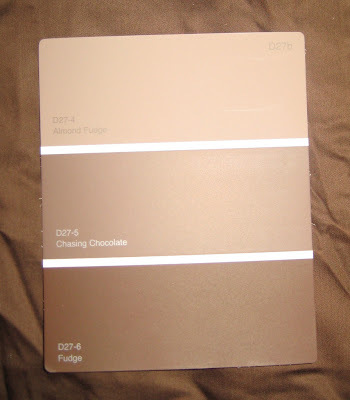 I think I have narrowed our paint color down to the one in the middle - "chasing Chocolate". We are going to have someone paint for us and I need to call him and set up a time. Our crib is in and we can't set it up until we get the room painted. Once that is done - I will feel like we are about 60% there. Fixing up the nursery is just so fun! I love her name and everything you've done!! Pink and Brown is one of my favorite color combos! I ended up doing my apt. turquoise/brown because I couldn't find enough pink/brown. IDK if y'all have it there, but scrapbook warehouse is AMAZING! LOVE the room!!! Where did you get the daybed...it looks fit for a princess!!! I love it! You are adorable. And I love the color! I LOVE that book you are making for Harper. I was never hungry during my pregnancies. I get hungry when they are about 2 weeks old and I start putting on the lbs. then. WEIRD! LOVE the baby book - how she will treasure this!!! And the brown comforter and paint color will look so beautiful in there - especially with the white furniture against it. You should consider a job in Baby Room Decorating, my friend!!! I love the colors and I just love the book you are making for Harper! What a great creative idea and a wonderful way to personalize a great treasure! I'm lovin' that day bed! Where oh where did you get it? I can't wait to see the final result. I know it will be adorable. How fun! I was like you - not hungry in the first half and so very hungry later on! Then, super hungry while nursing! You have done such a great job on her baby's book. I bought one that has some really neat things in it to fill in but your pictures are making me want to make a separate one for my pregnancy pictures, etc. It looks like it was so much fun to make!! And as always you are too cute!!! Love the book! Y'all will treasure that forever! Yay! The weekly update! I always look forward to seeing how big Harper has gotten. Your baby book is such a great idea and so cute! Can't wait to see the nursery come together. I don't recall being hungry all the time when I was pregnant ... but when I nursed, I ate like a football player!! Love the chocolate brown! 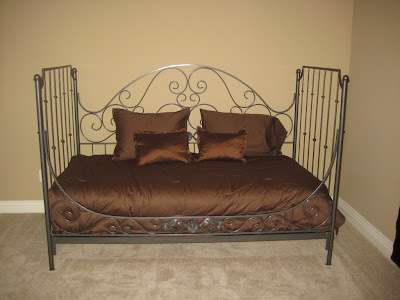 And that daybed is too cute! So happy for you! I love the baby book being a scrap book - I think that is a great idea and you can totally make it yours and it will be one of a kind and include everything you would want in a baby book - brilliant I tell you! Last week I looked back through my baby book with my mom and it was a really neat time for us to look at it together...lots of great memories. Such a good investment of time and energy! I nearly cried as I read this post. I've just been crazy this week anyway and I just had so much joy for you as I read this. The book is just precious and so meaningful. I love it. You are so creative. This book will be pricelss! As she grows into a young woman I know Harper will cherish this and my how she has grown!! What a precious size! I love the comforter and the colors look amazing! The daybed is beautiful. You are so talented at decorating. Everything is so Cute! I just wanted to write about eating and nutrition in pregnancy. I had my daughter 7 months ago and I want to recommend the Brewer diet for the healthiest start for Harper. I gained about 40 to 50 pounds and to be honest 90% came off in the first 3 weeks (seriously!). I have never lost weight so fast in my life! So just eat what you need to and seriously, don't worry about the scale, it can and will come off! Can't wait to see the room...it's all coming together! -your dress is so cute and looks so comfy! -the baby book you are making is such a GREAT idea and I love the cute paper! I stocked up at the 50%off sale too! -I love the daybed! I always had an twin or daybed for my kid's room and it comes in so handy if you need to lay down in there or for later when they outgrow the changing table and you need somewhere to change them! -the brown walls are going to be SO pretty! I'm LOVING Harper's baby book!!! A friend of ours gave us a baby book that you write in but there's never enough room to say what I want to say! I've been recording important things in it that I want to remember, but I think I'll try making one for D, too. That baby book is so cute! You are very talented. Oh, I love the name Harper. How cute. I also love the scrapbook pages.. they are to fun.. I stumbled onto your blog from another reader and I thought I would say Hi. You look great! I love the baby book. Harper will love having that when she's older! How did your Bible study go on Sunday? The room is looking great. I love that you are taking your picture with all the fruits/veggies. This is embarrassing to admit, but at the end when the veggies get bigger, I didn't know what some of them were & had to look them up on the internet. I'll need to come over & have some crenshaw melon around week 36! I love your baby book! So precious. I know Harper will love looking through that with you as she gets older. oooooooooooo you look wonderful in blue!!!!!! 22 weeks!!! can't believe it!!!!!! I love the scrap book and I love that you are putting in things pre-pregnancy...one day that will be so special to her you know! That she was so prayed over and waited for!!! so sweet!!!!!! love you friend!!!! Those paint colors are gorgeous. I can't wait to see the final product! You look adorable!!! I love the paint color...we have a lot of chocolate browns in our house and I think it makes a room feel so warm!! Can't wait to see the nursery put together! Your baby book is so cute!! I can't wait to see your nursery! The nursery looks like it is coming along very nicely. I love you choice of colors. The Baby book looks nice to! We don't know each other but I absolutely LOVE reading your blog! It brings back all the wonderful memories of when I was pregnant! I wish you all the best of luck! And I love the nursery and baby book! I am 35 as well and now on my second child. I gained 65 pounds with my first and I am only 5'3" so you can imagine I looked like a bubble. I lost all of that weight plus some with NO nursing after my little boy got here. now I am on my second child 14 months later...I promise the weight never really matters once you hold that precious little gift from God. I love reading your blog and I cant believe all the women that are expecting. Sheww god does great things! The book looks great so far! She will love that! And I also love the chocolate color for her room.. We have just started painting in our house and it's not as easy as it looks! Have a great Tuesday! Don't worry about the weight. I was 35 when I had my little girl (now 18 months). I gained 23 lbs. with her and believe it or not I lost it all in 2 weeks after she was born. I was breastfeeding and I think that helped. Now my body still needed lots of work, but the weight was gone. I think it's more what your body is normally like and not just your age. By the way I LOVE your blog. We are trying for baby #2 right now and have had some problems. Your site is really an inspiration to me! You look great! The baby book is going to be such a special item for Harper. I wish I had kept up more on my boys' books. Love the paint color too. I love that dress! Is it a Laurie special? What a GREAT idea! I love how you have done her baby book...very, very smart and cute! You look so pretty in blue!! Then again, you look good in ANYTHING! Love the scrpbook! You're going to be such a great mom! I love the scrapbook you are doing! Harper will treasure it someday. As for the weight, I wouldn't worry about that too much. I was 34 when I had my son and I gained 27lbs. I had a c-section and when I went in for my 2 week post-op checkup, I had lost 25lbs. When I went back in 4 weeks later for another checkup, I had lost 10 more. I didn't do anything to lose the weight, just breastfeeding. Breastfeeding was great. I ate more than I have ever eaten in my life and the weight just came off. I love your daybed, Kelly! Will it be in the nursery? You look so cute! I've been an eating (and peeing) machine too! I love this book idea too. Kelly, I know I say this over and over...but you just keep getting cuter and cuter! Look at your little belly! So sweet!! ;o) I was practically STARVING when I was pregnant with Amelia. I couldn't believe that I would eat a meal, and after dinner, I'd ask Mike what else I could eat. He would just give me wide eyes!! The book and room look adorable! OH! And videotape yourself pregnant...include some belly shots. I'm so not all about showing my bare belly when I'm pregnant, but the other day, Mike and I watched some old videos of me pregnant with Amelia and it was sooo hard to remember being pregnant like that! I am so thankful I have those videos...even if they are only for us to watch! I love everything about this post! I love that the time until Harper arrives is over half-way here! I love what you are doing for her baby book. I feel like I failed my children in this area. ha! I just never had time to get it all together (especially w/Derek being gone. I'm sure EG will forgive me). I love the brown comforter and I love the brown color for the walls! I don't blame you for hiring someone to paint. You don't need to smell the fumes and it is a ton of work. By the way, you might want to ask him about the paint with the lowest smelling fumes. I think with Sherwin Williams it is the Harmony line. It is all coming together, Kelly, and I couldn't be more thrilled for you. P.S. I'm STILL battling the weight I gained with EG. It fell off with Evan at 29 but has been much harder at 33, but I'm like you in that I feel like it was totally worth it! Love the baby book!! So cute =-). 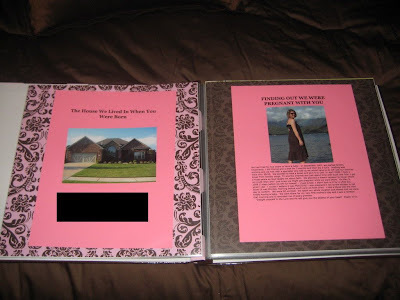 What a cute cute idea with her baby book--I'd love to get to look through it sometime! You'll have to bring it next time we get to visit! I just love your baby book pages. They are so sweet and will be a precious gift to your daughter when she is older. WOW! I love the room color! I love the day bed! LOVE IT!!!!!!!!!!!! The room is going to be amazing- I love the colors you have! That baby book is so precious- I know you have cherished working on every page and it will always be such a reminder to you and Scott, and to Harper of God's faithfulness. You encourage me to seek Him more, Kelly! Thank you! Thanks for being my friend, Kelly. We can overcome our "high school football differnces" with all we have in common!!!! You look adorable Kelly. I can't believe how big Harper is getting! I am loving her baby book...you are doing such a great job. What a treasure it will be for her in the years to come. Can't wait to see the nursery as it continues to come together! I'm loving that book. What a special gift for Harper. She will love it in years to come when she can go through and read it and see pictures of her cute parents and what their life was like before she was here. What a great idea! 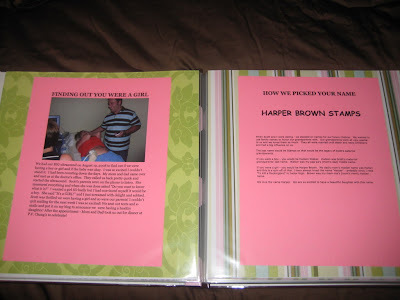 Great idea about doing your own baby book! When I was pregnant with one of the boys I went to Perkins with hubs to eat "dinner" which became breakfast. I order TWO, yes TWO of those Tremendous Twelve meals. LOVE the brown color! So chic! And how cute is the baby book. You (and her!) will so enjoy reading that through the years. You look so cute! I cannot believe how much Harper is growing! You are doing an amazing job on her baby book and I know that it will be something she will cherish forever! What a wonderful tribute to the faithfulness of God! The nursery is going to be gorgeous and I can't wait to see the "finished product"!